The 6th grade curriculum takes a deep look at the continent of Africa. During the second trimester, students are dedicated to answering the question, "How do others define us?" Students explore this question through multiple forums, with special attention to how Africa and Africans have been defined by outsiders. This week, our focus was on conflict minerals from the Democratic Republic of Congo (DRC). This topic is not widely known by most Americans, let alone 11- and 12-year-olds. At the start of class on Monday, none of our students had ever heard of this conflict, even though it is the deadliest war since World War II. For the last 500 years, the Democratic Republic of Congo's natural resources have been mined and harvested for sale on the national market. Today, the mining industry of the Democratic Republic of the Congo is a significant factor in the world's production of cobalt, copper, diamond, tantalum, tin, and gold. There has been a continuous exploitation of their natural resources and wealth; it has put an extreme amount of stress on the indigenous societies of the DRC. The extraction of the minerals are a benefit to many, yet also a detriment to those in the DRC. During this trimester, the 6th grade brings in experts to give presentations about various topics and provides time for the students to interview the guests. Today we were lucky to have Dr. Omékongo Dibinga come into our classroom and share his wealth of knowledge and experience. He was born in Cambridge, MA, but his parents were refugees from the Democratic Republic of the Congo. Omékongo is an American poet, musician, motivational speaker, diversity consultant, CNN contributor, and positive rapper. After his presentation and interview with the students about conflict minerals in Congo, the class was inspired by his mission and hope for the future. The 6th grade is going to create some type of project that will continue this work of bringing attention to the conflict and ending the use of conflict minerals in the western world. 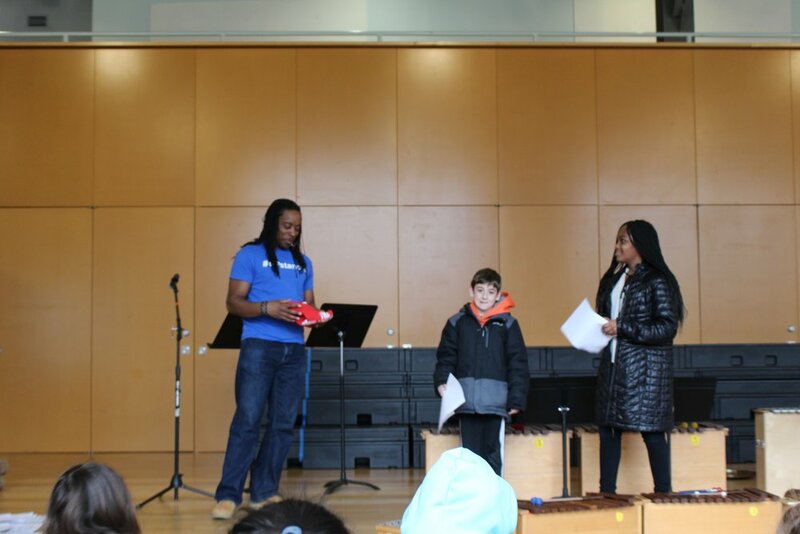 In the afternoon, Omékongo presented to students in grades 4, 5, 6, and 8 about being in UPstander, which also happens to be the name of his organization. His life’s mission is to inspire people all around the world to take a stand when they witness an injustice, no matter how small or large. During this afternoon's presentation, Omékongo spoke about being an upstander when it comes to bullying, racism, and social justice. His message was inspiring, especially in such a politically charged world right now.